We moved to Knoxville, TN 17 years ago and couldn’t imagine living anywhere else. It’s a beautiful city near the Great Smoky Mountains. There is so much beauty here with an abundance of things to do. Whether you are traveling through the city of Knoxville on your way to a vacation destination or live in the Knoxville area, there are plenty of things to do that will not break your budget or cost you money. 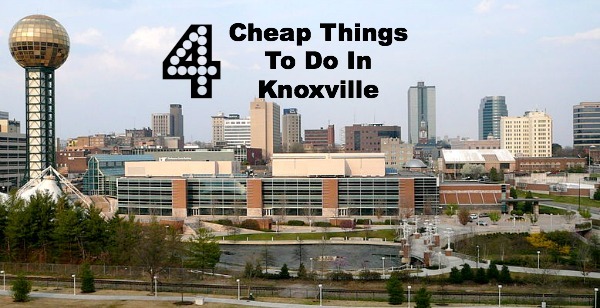 Here are the top four cheap things to do in the city of Knoxville. These ideas are perfect for your next family day in the city. No trip to downtown Knoxville is complete without a visit to the Market Square District. You can visit the Mast General Store, go to any of the unique boutiques and shops that are perfect for all ages, taste and designs and of course stop in at the Peanut Shop to sample peanuts of all varieties. There is often live music, ice-skating in the winter and special festivities throughout the year. This is a slice of Knoxville life that is well worth the time. If you travel in Knoxville you will have seen the gold ball that towers over the city. This is the site of the 1982 World’s Fair where you can take a free elevator ride to the top of the gold ball and get a magnificent view of downtown Knoxville and the surrounding areas. While you’re at the World’s Fair Park enjoy a splash through the Court of Flags fountains, and walk through the memorial park or simply take some time for the kids to play at the fun playgrounds. If you love to read, you will love taking your books that you are done with and trade them in for store credit at McKays Used Bookstore. You can also get cash for your books and media, but your best deal is trading for store credit and picking up new books with that credit. The IJams Nature Center offers a beautiful view of the river as well as a great hike down through the woods. Check out the children’s natural play area as well as the indoor nature center. You can spend time wandering through the woods getting some beautiful photo opps or just spend a few minutes as a good stretch break through downtown Knoxville. What are your favorite places to visit for free (or on the cheap) in the city of Knoxville? I’d love to hear! These sound like great ideas of things to do in Knoxville. That book store sounds really appealing. We have a local book store that takes trade ins too. Love it! Ah man! I wish I knew about these places just a couple of weeks ago when I went to Gatlinburg. They sound like places that I would enjoy exploring. I had no idea that the World’s Fair was held in Knoxville at one time. Next time I get a chance, I am going to visit those places. Thanks for the info! The Ijams Nature Center sounds nice. We like hikes and nature as a family. I’ll have to remember this the next time we go to Knoxville! Thank you for sharing. Sounds like a lot of fun. I’ve never been but would love to try the elevator in the World’s Fair Park! I haven’t been to Knoxville in ages, but I wouldn’t mind visiting again. Thanks for the budget-friendly ideas! I have never been to Knoxville, or anywhere in Tennessee, but I am sure there is a lot of fun to be had. I’ve never been to Knoxville, but those look like great things to do while visiting. I hope to make it there someday. I’ve only passed through Knoxville, but it looks like I’m due for a stop. I want to visit the World’s Fair park. This is a great list. We were hoping to visit Knoxville this summer, but it just didn’t work out. Hope to get there some day though. I haven’t been to Knoxville, but it is on the list. I’ll have to keep this list of things to do in mind for when I do go. Ooh, my girls would love that bookstore! I would love to move to Tennessee! We vacation in Pigeon Forge every year, and would like to eventually get down that way. I love Tennessee! It’s so beautiful.